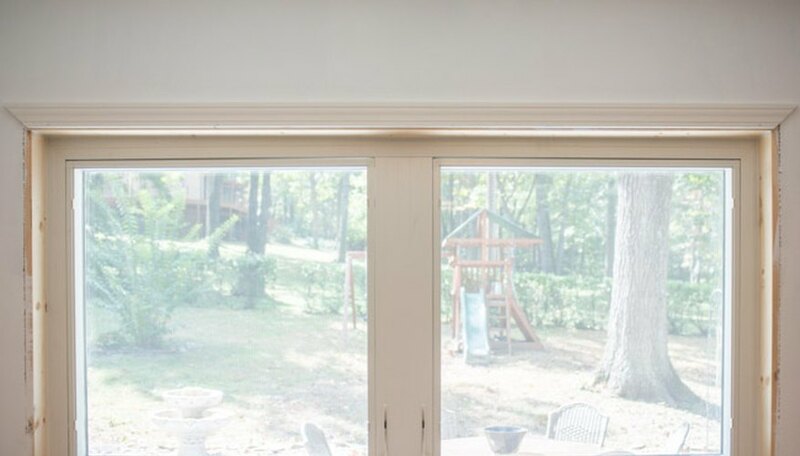 This tutorial gives you a step-by-step guide for installing interior window trim, including how to finish it off for a professional look. 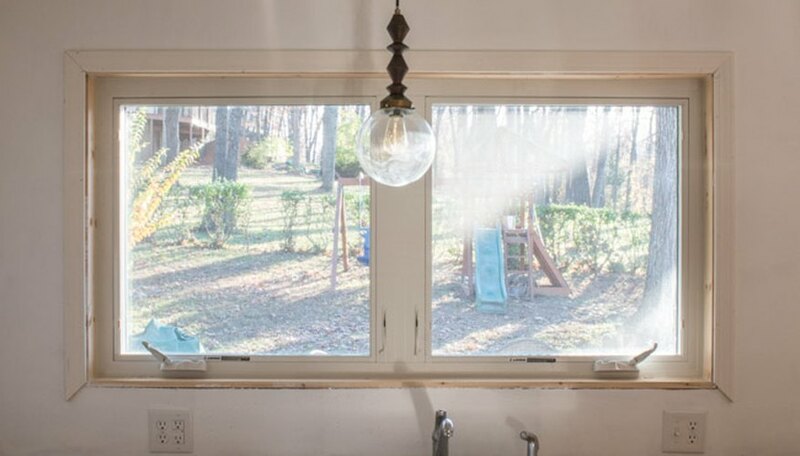 Whether you're installing a new window or just have an older one that could use a refresh, these steps will guide you through the process. You can use a simple, modern trim (like the one in this tutorial) or you could go for a more ornate look. The steps are the same either way. So feel free to infuse some of your own style into your space to get the look you want. Using a measuring tape, measure across the top of the window. For reference, the measurement for the length of this window is 71 inches. 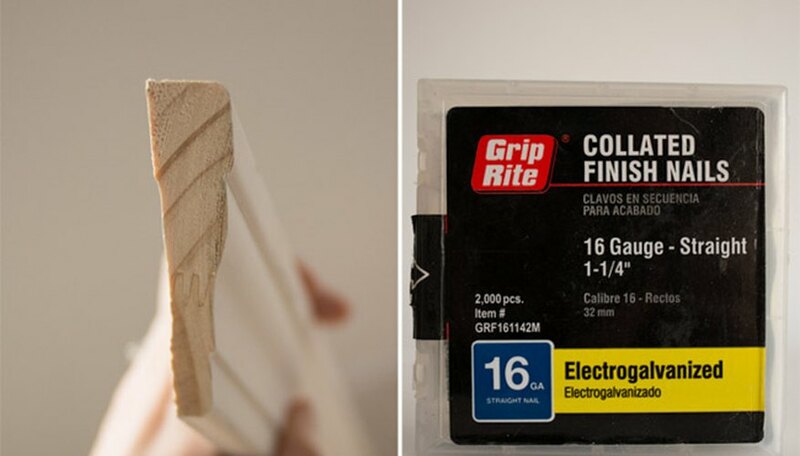 Place the trim on the miter saw with the skinny part closest to the saw. On the left end of the board, make a -45 degree cut. From the end you just cut, along the skinny edge, measure out 71 inches. Cut the opposite end at +45 degrees (keeping the trim piece with the skinny side facing the miter saw). Now, you should have the top piece of the window cut. 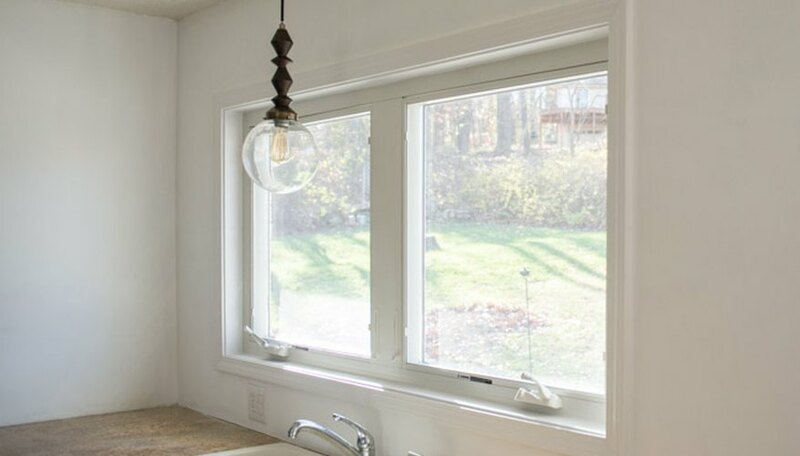 Check your trim piece against the window to ensure that the skinny side of the trim matches the window length (71 inches). Gather your finish nails, nail gun, air compressor and level to put the trim up. Put the trim on the window jam, leaving 1/4 inch of the jam still showing. Nail the trim in place, making sure to keep an eye on the level as well as the 1/4 inch jam distance. Repeat steps 2 and 3 for installing the side trim pieces, using the measurement for the window sides. 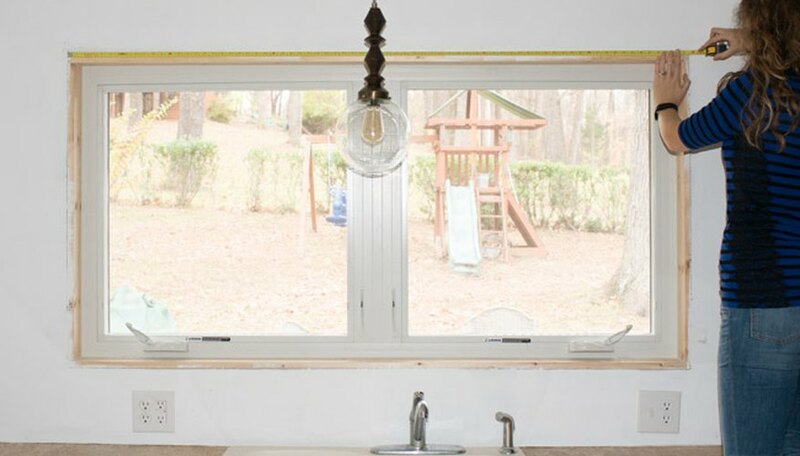 You might find it easiest to cut one side of one trim piece and bring it to the window. Check the fit and place a mark on the trim piece where you want the next cut to be. Repeat step 2 and 3 for installing the bottom piece of trim. 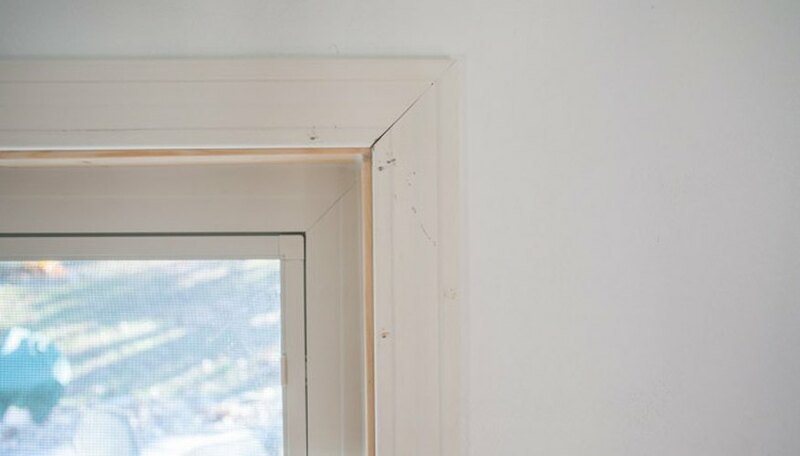 The bottom piece of trim should be the exact same measurement as the top piece. Sometimes, your air compressor can lose a bit of pressure, causing your nails to not fully sink in. 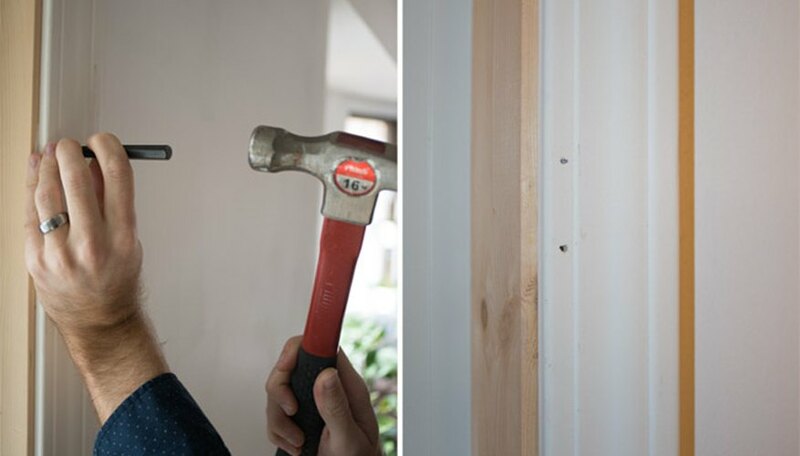 If that happens, use a hammer and nail punch to tap your nails in so that they are flush with the trim. Fill all the nail holes with wood filler as well as the cracks where the trim pieces meet up. 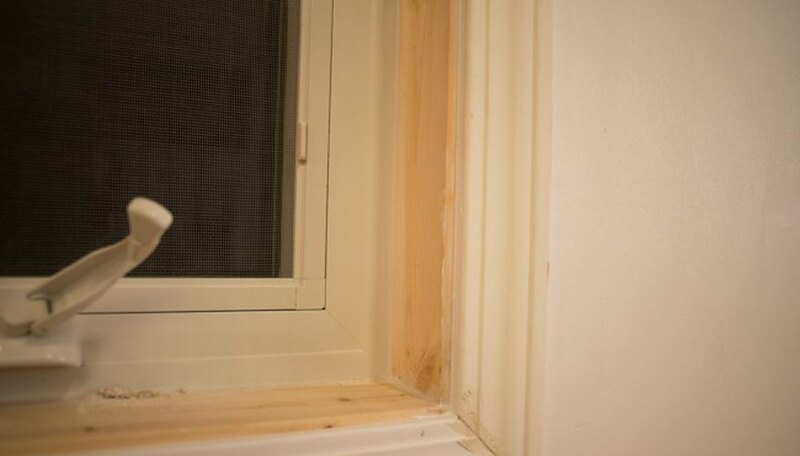 Use paintable caulk and caulk in between the window jam and the trim. On the outside of the trim, caulk between the trim and the wall. Let dry. Once dry, take a medium grit sanding pad and sand any excess. Repeat this process if needed. Prime the window jam and trim. Paint over the primer once the primer has dried. Apply another coat of paint if needed. 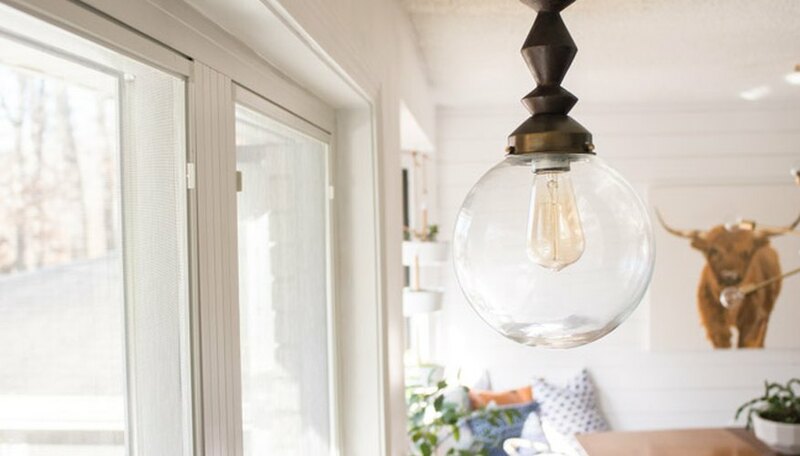 Ashley Mayes is a blogger and home renovator at Bigger Than The Three Of Us. Her projects have been featured on Good Housekeeping and Apartment Therapy. She holds a Bachelor of Arts in business from Missouri State University. 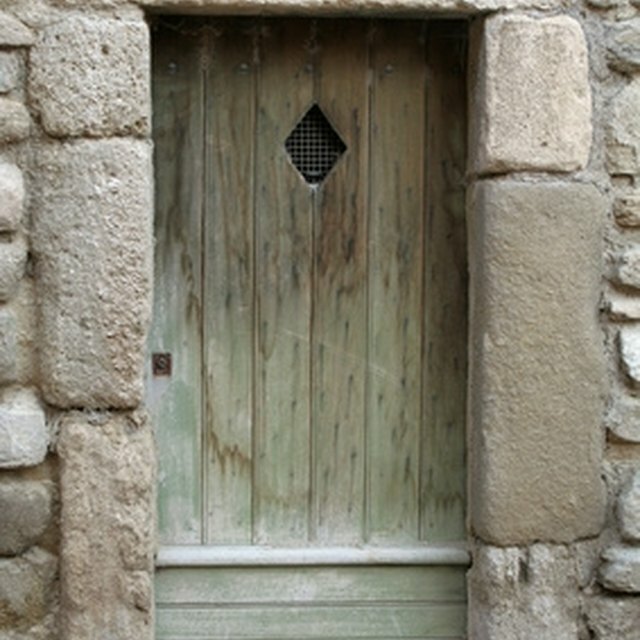 [DELETED]What Are the Causes of Excessive Urination?